How many words does it take to tell a story? A book usually runs somewhere north of eighty thousand words, though there is no magic length. With that abundance of keystrokes available, the author has plenty of time to develop a fulsome plot and a cast of beguiling characters who carry the story to, one hopes, a satisfying conclusion. But writers of short stories, which generally top out under twenty thousand words, don’t share the luxury of time and space to accomplish all of the above, and in the case of a crime story, deliver suspense as well. Any story told in short form can be more difficult to produce than the long form. But a fully realized crime tale in only a thousand words is, indeed, a challenge. Otto has assembled eighty-one examples of super shorts in an anthology called Kwik Krimes, released this month by publisher Thomas Mercer as both a trade paperback and in electronic formats. It’s impressive how much the authors managed to deliver with so few words. And it is fascinating how much variety there is in form, style, tone and substance among these little tales. The stories range from sweetly humorous to bleakest noir. “After,” by Long Beach author and professor of creative writing Tyler Dilts, is a fine example of classic noir. His offering is a grisly story told from the rarely-used second person point of view, in present tense, with an unconventional structure. The language is spare, there are few details, but the story is rich in imagery, plot and characters. It takes talent to pull all that off, no matter the length of the work. In contrast to Tyler’s idiosyncratic style, my friend Gar Anthony Haywood’s story, “The Einstein Divorce,” told in third-person, has a traditional novelistic, linear structure. What makes this story so much fun to read is the very strong authorly voice, well-drawn characters, and a triple twist plot, which took a particular sleight-of hand to accomplish in the number of words allowed. Tricky indeed. But fun. My contribution to the anthology, “Full Bloom,” is an 880 word tale about a woman who loves her garden. And whose husband has gone missing. While writing the story, I kept thinking about the old joke about the guy who, admiring Michelangelo’s sculpture of a horse, asks the sculptor about his process. Michelangelo’s apocryphal response: “I just take a block of marble and cut away everything that doesn’t look like a horse.” Easier said than done. Not long ago we had an early September freeze that threatened my veggie patch, and lo, this morning the temperature is climbing into the 90s. I recall summer camp as a kid in mid-August, and pulling my green shorts on under the bed covers because it was too cold to stand up in my thin pjs. One of my bunk mates was wrapped in a blanket as she headed for the bath house–forgetting how two hot weeks earlier she’d shoved ahead of me where I was waiting for a cold shower. Later she apologized for pushing me aside. “It was the heat did it,” she said, as though the heat–and later the cold–was somehow animate, and living intimately among us. Now the rain is slashing my study window, its hot fingernails scratching at the glass as though trying to break in. trying to stab me…and I want to choke it off–make it stop! It’s stifling in here despite the downpour, and my weary fan only scatters the papers on and off my desk–it doesn’t cool my face. “Stinking weather!” I shout at the cat–and panicked, she leaps off my lap. From which I infer from Leonard that it is okay to elaborate on a character’s reaction to the weather–and at the beginning of a book as well as in medias res. i want to start my story with the rage I’ve been feeling about this thundering deluge that will keep me this afternoon from harvesting tomatoes and taking a leisurely think-walk in the woods behind my house. Yi yi! Then what does a hot, wet and angry planet bode for our crime novels? More reason for violence? Bad weather as a villainous character in our books? I think of Madeleine L’Engle’s A Wrinkle in Time that begins with (yes it does!) “It was a dark and stormy night.” And in walks “a most disturbing stranger,” upsetting the status quo, transforming the characters’ lives. Or Gore Vidal’s Williwaw: a ship caught in frigid Arctic waters with few women on board and male jealousies running berserk. I think, too, of the night of thunder and lightning that engendered Mary Shelley’s Frankenstein. And the year-of-no-summer, 1816, when skies went black, crops failed and people stole and lashed out–which paradoxically , brought prosperity for writers, including my friend Lee Kemsley, who has just brought out a YA novel, The Hunger Year. In 1998 a powerful ice storm struck Vermont, felled trees and power lines, and for a whole week food rotted in our refrigerators. I cursed the electricians who were too busy elsewhere to come to my house. But my novella, Fire and Ice, in which someone hurls a giant icicle at a woman’s head, was published as a Worldwide Mystery Library original. Should I have been cursing–or thanking the calamitous weather for bringing me publication? Writers thrive on adversity, yes. I remind myself of that on freaky days like this one, when I complain about the weather. I will begin my story with rain and hail–after all, Shakespeare’s Macbeth opens with “Thunder and lightning. Enter three witches.” And I’ll blame the subsequent violence on it, as well as on my chosen villain, who will surely be an ordinary person like myself, propelled to mischief by the explosive skies. I get to post a blog on my birthday! Does that mean I want to, or have to, write about my birthday? At this stage of my life (age 68), it might be just as well to walk past it whistling, as though I’m passing a graveyard at night. I guess there will be a small celebration with those of my family who are nearby (wife, son—possibly sons— daughter and fiance, grandson). 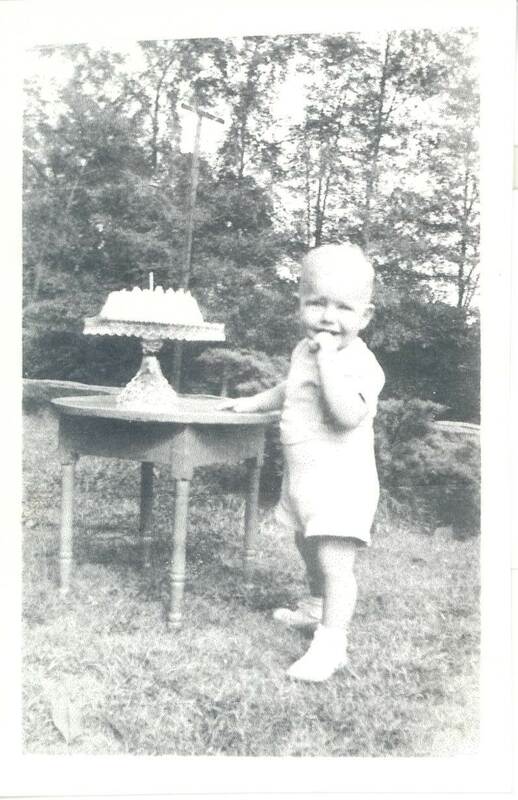 There will be a cake, presented on an antique glass pedestal cake plate that has been in my family since the 1930s. We have a picture of my grandfather with that plate before I was born and a picture of me standing (barely) next to it on my first birthday. I always tell my wife that I will wash the plate and put it up after we’re done with it. Not that I don’t trust her. It’s just that, if anything should happen to it, I don’t want the blame to fall on anyone else. And not because of its potential monetary value, but just because it’s been in my family for so long. I don’t think of myself as one who places high value on objects. When I think about that plate, and other items I’ve inherited from my mother’s family, I don’t immediately think of their monetary value. (Similar plates in antique stores are priced at around $150.) What I cherish is the connections those objects represent—connections with my mother, with my grandparents, with my cousins. Those connections are particularly important to me now because my parents and grandparents are no longer living and I am seven hundred miles away from my cousins and their extended families. I’m the only member of my family who has spent more than half his life on the “wrong side” of the Ohio River. Aside from being my birthday, September 23 is noteworthy in other respects. Depending on which astrological chart you consult, it is the first day of Libra or the last day of Virgo. It is “on the cusp” between the two signs. I don’t buy into astrology but I do wonder if that might explain why I sometimes find myself torn between two options. Did I mention that I was an English/History double major in college? And my doctorate is in Classics with Historical Emphasis. Mickey Rooney was born on September 23. That might explain all those wives. Athletes are fond of 9 and 23. Consider this short list of those who’ve worn #9: Ted Williams, Gordie Howe, Bobby Hull, Reggie Jackson, Mia Hamm, and Roger Maris. For #23 we can start the list with Michael Jordan, Ryne Sandberg, LeBron James, Don Mattingly, and Kirk Gibson. My wife’s brother was born on September 23, as were one of her uncles and two cousins. Sometimes I think she married me because my birthday would be easy to remember. There is a curiosity called “The 23 Enigma.” This is the belief that everything is connected to the number 23. To start with, all humans have 46 chromosomes—23 from each parent. Shakespeare was born on April 23 and died on April 23. His wife died in 1623. Julius Caesar was stabbed 23 times (but according to the earliest source we have, it was 35 times). You can read an interesting piece about this at: http://askville.amazon.com/number-23-special/AnswerViewer.do?requestId=4060915. Have you ever wondered why September, which means 7, is the ninth month of the year? And what about October (8), November (9), and December (10)? Well, the Romans first started their year in March. About 150 BC, for reasons we can no longer discern, they switched to January as the beginning of the year. July used to be Quintilis (5), and August was Sextilis (6). Those months were renamed in honor of Julius Caesar and Augustus. A good thing, too. Celebrating our independence on the Fourth of Quintilis just doesn’t have that ring to it. The Roman emperor Domitian tried to stick one of his names, “Germanicus,” on September. That didn’t last any longer than he did, I’m happy to say. So, enjoy this auspicious day. What I’m most looking forward to is the return of “Castle” tonight. We’ll find out how Beckett reacts to Castle’s marriage proposal. I live as if I’ve caught up with technology. I of course have a laptop. And a printer that does everything but sing love songs. And a Kindle. And an iPhone. I do more shopping online than on foot. And more and more of my books are in or on the way to being e-books. I have a Facebook page and I’m on Linked In. I do this blog once a month. And I’ve had a website for years. Really on top of it, right? Wrong. Not only have I not caught up, I never expect to. We writers rattle on and on about all these things, these scifi creations by people who talk about Nanos the way we talk about verbs. I have friends who create and market their own e-books, not wanting to share the profits or the decisions with a publisher. I have no idea how to do that. POD—is that even a real thing? Because I’d love to have new hard copies of my hardcovers-turned- e-books. You know, something to put on the solid, made-of-molecules, boards of a bookcase. I don’t know how and I don’t have time to wander weeping through the cyber-world. As I said, I’ve had a website for years. I edit the words, but have never figured out how to put graphics on it, so the covers of the new Samson’s Deal, the new Free Draw, the even newer Blackjack may never make it onto the virtual page. Until I get around to asking someone to do it for me. Same with Facebook. How is it that so many people blithely toss their photos into the ether and have them show up there? I’m smart, right? Can’t make it work. And Linked In? What is that for, anyway? And I’m damned if I’ll Twitter. Keeping up, learning to use all these things, seems like another full-time job. I already have at least two. I’m terrified that if I ever do get a better grasp, at least, on some of these mysteries, tech will take yet another quantum leap and I’ll be lost forever. Owing to the fact that I was a swot from the first grade on, I’ve always liked September. When school started the day after Labor Day, I was ready for it, pencils sharpened. Since 2001, however, the month has had a sour edge, which is hardly fair. After all, ghastly things have happened year-round. Pearl Harbor didn’t ruin December, though it sure ruined my mother’s December 7 birthday. So what’s so great about September? It’s the beginning of the new year in the Jewish calendar, whereas the Christian calendar (the Gregorian one anyway) is supposed to start the first day of Advent, the Sunday after November 30, the feast of St. Andrew. The Roman calendar began with the two-faced god Janus, but the Celts started their year on what became All Saints’ Day, after a chilling encounter with the ghosts of the dead on Samhain or Hallowe’en. There are also folks who start the year in February and March. I think September feels like a beginning, but it could be the beginning of the end. If you think about it, school schedules don’t make sense, with the big holiday in summer when most parents would prefer not to see their offspring 24/7, but the schedule is a leftover from agriculture. September comes just after the main grain harvest, and before those autumnal bloodbaths, hunting season and the slaughter of animals that can’t be fed through the winter. A less gruesome way of looking at the season is to see September as the vendange, the grape harvest, squish, squish. The beginning of Wine. The days are getting perceptibly shorter by September, coming down to equinox toward the end of the month. You would think we’d have major holidays marking the earth’s passage around the sun, but no. My brother Brian was born on the autumnal equinox–a fine equable fellow and worthy of a holiday. The Romans numbered some months and named others after gods or deified emperors. Julius and Augustus caught on, but September remains stubbornly seven. Better seven than Nero. Please to remember the fifth of Vespasian? Beware the Ides of Brian. In September, the days and nights may be roughly equal, but the weather is not equable. Some of our finer hurricanes, not to mention monsoons, have occurred in September, thus providing us with a fire-proof topic of conversation just when we start school and meet a bunch of new people. Right now folks are cluck-clucking about the floods in Colorado. At the risk of turning this into a family blog, I will just mention that my sister, who lives in Lyons CO, did not drown, and even called to tell me she was still alive. There. Happy September. After giving myself a couple of years of breathing space since turning out twelve mystery novels in my series featuring an equine vet, I’ve finally settled in to my new writing project. I knew I wanted to write a memoir, but I wasn’t sure what the point would be. I didn’t want to waffle on about my memories, I wanted to target some unique aspect of life that I was fitted to convey. Uhmm, it took awhile to work this out. In the meantime I wrote a brief memoir in a series of blog posts for the Equestrian Ink blog, about my life with horses. This piece of work ties into my mystery series and essentially gives the background from whence the books sprang. It was lots of fun to write and it will be up on Kindle shortly (as soon as I get the cover worked out) as a 99 cent special. Since then, I read a book (The Ocean at the End of the Lane by Neil Gaimon) that clarified for me the subjects that I really want to write about. And that would be life, death, magic, old spirits and God. Not that I have the skill to write about these things. But I have the desire. I am quite sure that my memoir will fall far short of Neil Gaimon’s wonderful book, but that’s OK. So I’ve begun, and I am really enjoying writing the book I want to write, constrained by no one’s concepts but my own. To tell the truth, I have grown quite tired of concocting a crime and then a plot that contains just enough excitement…etc. I am interested in writing the truth as I see it, whether or not it pleases anyone else. Because of Amazon and Kindle, I can put my memoir up myself, and because my backlist has a steadily growing readership, there are probably readers who will buy my new work. So yes, in a sense, I will sell my book. I have heard of authors who deplore this new system, and I have to ask: What is it you don’t like? What is bad about getting a 70% royalty on every book sold? What is not to like about getting a check every month that pays for the groceries? I have never been anything other than a mid-list author, and I am still a mid-list author, but for the first time in my writing career, my books are bringing in a steady, useful income. What is bad about that? So yes, my memoir will eventually be for sale on Kindle, and I will suffer the one or two star reviews (no doubt) from those fans of my mystery series who can’t fathom what the point of my plotless memoir about magic could possibly be. And that’s OK. Because these same fans have rated most of my backlist between four and five stars, and been a big help in increasing my grocery money every month. So today I’d like to say a big thank you to every reader who has reviewed my books on Amazon. I really appreciate you. I hope you will enjoy my memoirs, and if you don’t, and wish I would return to writing mysteries, I understand. If, just by chance, you have enjoyed my mysteries and haven’t yet posted a review, well, all I can say is that these reviews on Amazon are terribly important to authors nowadays. Every single one is appreciated…and I think I can say that this is true for every author out there. Feel free to give your own thoughts on this subject. If things don’t work out with this author thing, I’m considering becoming a restaurant critic. I’m a food aficionado. Fortunately I don’t have a weight problem so I can indulge my passion. At least I could until I ended up in the hospital with a severe gastritis and my doctor gave me a list of do’s and don’ts. Mostly don’ts which is somewhat comparable to asking a teenager to give up video games. So I’m compromising. Not being a coffee addict, I’ve acceded to decaffeinated although for some inexplicable reason, that too was on the no-no list. Passing up chocolate fondue or mousse has been more difficult but there are other desserts I find tempting. And I can live without fried foods. Wine was on the “once in a blue moon” list but there, much to the disapproval of the teetotaler with whom I live, my compliance ends. In my younger years I lived in France not far from Paris, and developed a sophisticated palate, and most particularly a taste for French food and wine. I never made it to the “greats” (money being a factor in those days) but the bistros I frequented were wonderful and mostly within my meager budget. While there, with the help of Julia Child’s “Mastering the Art of French Cooking” and a little recipe book called “Pardon my Foie Gras,” I learned the tricks of the trade and became quite a competent cook. Duck à L’Orange was my pièce de resistance. But after raising three kids and having prepared thousands of meals over the years, I’ve kind of lost my zeal for all those hours in the kitchen. Not, however, for the gourmet food, so I’ve decided to let others do the creating while I enjoy the fruits of their labors. For holiday dinners I’ve passed the mantle to my middle son who is an excellent cook. He actually grows his own herbs. When I moved from New Jersey to California bringing my spice cabinet with me, he asked me if the spices were older than he was. To be truthful, some of them were. Recently when I was in New Jersey visiting my eldest son, we had dinner at a highly rated, high-priced newly opened restaurant in an affluent northern New Jersey town. I ordered one of the specials—yup, you guessed it–Duck à L’Orange! I started with clams on the half-shell, not exciting but an appetizer almost impossible to obtain in the part of California where I now live, so perhaps partly for that reason, I enjoyed them immensely. I downed a glass of a full bodied Barolo and waited for the server to appear, my mouth watering in anticipation. The duck arrived. It was overcooked, stringy, and tough, and the sauce if there ever had been any, had been totally absorbed by the thirsty fowl. Aware, like all French cooks, that an excellent sauce can cover many a disaster, I asked the server for additional sauce. I never saw him again. Another server offered the dessert menu and ultimately brought the very considerable check. 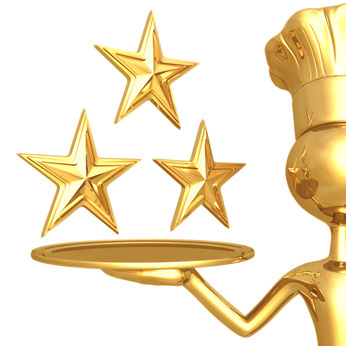 In my new role as critic, I gave this overpriced restaurant two stars for the food, and one for service. No second chance for this place. What popped into my author mind, however, as I sat there composing a nasty review in my head, was the customer reviews of my books that post on Amazon, and the importance of stars in today’s world of internet reviews. Stars have meaning. Four and five star reviews sell books. While I’ve been fortunate to have received mostly four and five star reviews for my “Other Deadly Things” mystery series, there has been an occasional three and even a couple of twos. I’d like to believe that those customers are misguided and lacking in taste, but I have to admit that for a very few readers (emphasize few) my writing style or perhaps my sense of humor just isn’t their cup of tea. Back to Nancy’s Restaurant Guide. Judging from my son’s well-cleaned plate, he seemed satisfied with, if not ecstatic over his Bronzini Pasticciata, as was my grandson with his Saffron Pasta del Mar and his Double Chocolate Something or Other dessert. I remembered that I had enjoyed the clams. Maybe I’d been too harsh. Did I want to be responsible for this restaurant’s closing? Or for the chef losing his job in this horrible economy? It’s possible that he’d been rushed and pressured that night and had a momentary lapse, forgetting about my duck sizzling away on the grill. Or maybe he’d turned the duck watch over to an inexperienced sous-chef. This was an Italian restaurant. Maybe the chef had never prepared a French dish. Maybe he ran out of oranges. Not really acceptable excuses and I’m not giving him a pass, not at that price, but based on the success of the other dishes, in my imaginary guide, I’ve upped him to a three. The server who never brought my sauce, however, remains a solid one. It’s interesting that when one is on the receiving end of reviews, one becomes a little kinder. Not less discriminating, but more understanding. If I am disappointed in a book I may not finish it, but I don’t write a bad review. But that’s me. As an author, I’m more aware that opinions regarding the same work can vary dramatically depending on the readers own life, his or her genre preference, or on factors I can’t even imagine. Not being a chef, I feel entitled to state my opinion online or in my future guide. What qualifies me to judge a restaurant? Well, I guess the same thing that qualifies my readers to render an opinion on my books. Like it or not, the star system is here to stay. And there are things to be learned, even from a bad review, so long as it is not written with malicious intent. The Italian chef might have learned that duck is not his forté and he should stick with Italian dishes. I’ve learned that when I updated my series using the original manuscripts instead of the copyedited galleys, I should have hired a proofreader! I may write that guide someday, hopefully not for the aforementioned reason. As for all you reviewers who have taken the time to tell us authors what you think about our books, even the reader who criticized me for having Carrie “send her Jewish children to Sunday school,” but especially those of you who let us know that you’ve enjoyed our books and that you’ve bought everything we ever wrote, you just keep on doing what you’re doing. You make our day. P.S. Jewish children do go to Sunday school. Mine did, kicking and screaming all the way. But that’s another story.